This shelter-in-place kit was designed using US Government recommendations for food, water and safety supplies to shelter in place for 24 hours. It is ideal for office use, in warehouses, classrooms or to provide food and shelter during disaster relief efforts. This kit contains twice the recommended amount of drinking water. 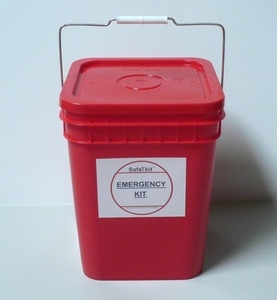 All Emergency Supplies are packed in a conveniently sized square red 4 gallon plastic container with easy-off lid and carry handle. The container is 14x12x12 inches and can easily be stacked, allowing storage of large amounts of emergency supplies in compact spaces. 4 - 2400 calorie Datrex Food Bars with pleasant cookie flavor. Food Bar: Each food bar has a 5 year shelf life and divides into 12 rations. Consume one ration every 6 hours. Drinking Water: The water has a 5 year shelf life. We include twice the recommended minimum amount of water in this kit. Emergency Blanket: wrap person in foil blanket to retain body heat. Do not cover face! Glow Sticks: safe to use, provides ambient green light. Simply bend and shake. Water Purification Tablets: use 2 tablets to treat 1 quart of water. Instructions included. 15 - Plastic bandages 3/4" x 3"
3 - Fabric bandages 3/4" x 3"
5 - Plastic bandages 1" x 3"
5 - Junior adhesive plastic bandages 3/8" x 1-1/2"
1 - Elbow & knee plastic bandage 2" x 4"
The amount of water and/or food provided in this emergency kit is designed to provide a minimum amount to ensure survival over the time duration this kit is designed for. Beyond the emergency kit's designed duration, intake of food and/or water needs to be increased to commonly required long term sustainability needs. To calculate the cost of shipping, please click the item into the shopping cart, then scroll down on the shopping cart page and enter your zip code into our Shipping Cost Calculator and click apply. The shipping cost will be displayed along with any taxes that might apply to your order. We charge actual discounted shipping rates and do not make profit on shipping! home | contact us | privacy / terms | view cartCopyright © 2006-2018 www.SafetyKitStore.com / All Rights Reserved.